Your home is your castle, and protecting it from invaders means having the best protection. When you send in the pest control cavalry to win back your home, they set up plans that are specific to your needs. They take into consideration the size of your home, the level of infestation and long-term prevention. You also have the option to do pre-treatments on new construction, perimeter treatment to keep bugs at bay and emergency services to treat hives and nests. Exterminators will continue to monitor your home, showing you the exact treatment areas and all improvement. Paying a regular fee up front can add up and cost several hundred dollars a year. However, it can cost thousands of dollars in home repairs if termites or carpenter ant colonies go unnoticed. You may not know the signs of carpenter ants or how to properly inspect for termites. Termite control companies know exactly what to look for, and the cost of their service is mere pennies compared to repairing prolonged termite damage. No one wants to take time off to wait for the “bug guy” and pest control companies know this and are willing to work around your schedule. If you request a free inspection and a price quote for service, you’ll find that almost all exterminators work past sunset and on weekends. Controlling pest infestations takes time, and using pest control products in a timely matter is key to successfully protecting your home. If you are looking to do it on your own, you can easily forget when to retreat your home. 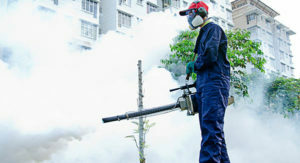 Pest control companies monitor and report every time they spray and know when to retreat before the product stops working. The best part is; if you need help with a new onslaught of bugs, many companies will come back and retreat for free. Have you ever heard that killing a killer bee will attract the hive and swarm you? Using a wrong elimination method will have the same consequences with many pests. Bees will swarm and mice can scatter, carrying diseases like the deadly Hantavirus, when their nest is disturbed. Using an exterminator means having someone who knows how to deal with potential nests and the risks inherent with treating them.